No matter how you define it, we can all agree that a platform is powerful and can offer a lot in terms of support for business. A platform that specializes in spatial data can be referred to as a Location Platform. 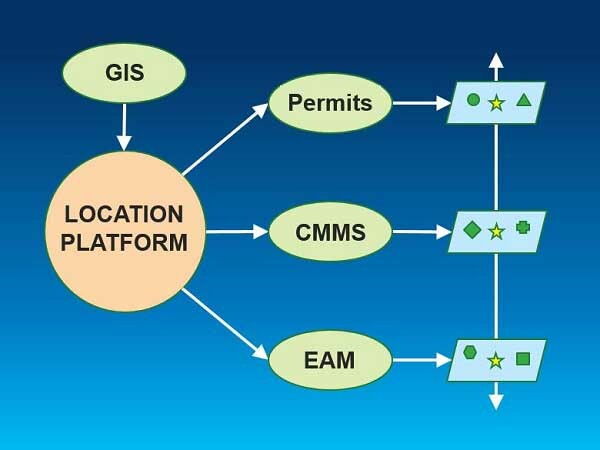 A Location Platform is different than a traditional desktop GIS in that it provides spatial awareness, geoprocessing, and other functionality across a wide variety of systems and devices. By implementing a Location Platform in your organization, you can provide much more benefit than was possible with desktop GIS alone. Organizations invest a large amount of resources into various mission-critical enterprise business systems like Permitting, Enterprise Resource Planning (ERP), Enterprise Asset Management (EAM), Business Intelligence (BI), Computerized Maintenance Management System (CMMS), Customer Relationship Management (CRM), and other such systems. Why? Because they address a necessary workflow in the organization and get a positive Return On Investment (ROI) from them. Usually that ROI is in the form of providing insight into various factors that allow the executives, managers, and the organization as a whole to perform better, make better decisions, be more efficient, comply with regulations, and so on. These systems are usually stand-alone systems. Though data might flow from one system to another, they are usually tasked with their own specific purposes. In addition to these systems, many organizations also implement a GIS. Typically the GIS is a stand-alone system though it will interact with other systems and their data. 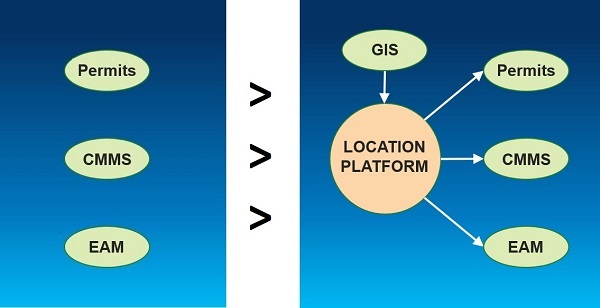 One of the best ways to get more ROI from the GIS is to use it to power a Location Platform. That Location Platform can then geo-enable the other enterprise systems. Once the enterprise systems have been geo-enabled by the Location Platform, their data can be mapped. This is a very powerful capability. Now we can see how the data across these systems relate to each other spatially. We can see if there are correlations between what is happening in these systems. This spatial insight provides more value than the sum of these individual systems, and gives a unique perspective that no other technology can provide. Once these systems are geo-enabled, the data can then be fed back into the GIS to perform spatial analysis, modeling, predictive analytics, etc. The time is now to make that transition from GIS to Location Platform. Over the years, we have evolved our software from a collection of products into a true Location Platform which includes ArcGIS for Desktop, ArcGIS for Server, and ArcGIS Online. If you own ArcGIS for Desktop and Server, then you already own the platform (Desktop includes ArcGIS Online). So make plans to migrate your GIS into a Location Platform to better support your organization. So how do you migrate your GIS into a Location Platform? Let’s look at the diagram below. In the upper right you will see three enterprise business systems (Permitting, Work Orders, and EAM). We would geo-enable and integrate them with ArcGIS for Server using best practices like web services and/or routine Extract, Transform, and Load (ETL) data movements. Executives will access it using the Executive Dashboard application from our ArcGIS for Local Government program. Departmental managers and supervisors will access it via an operational viewer using the Operations Dashboard app included with ArcGIS Online. 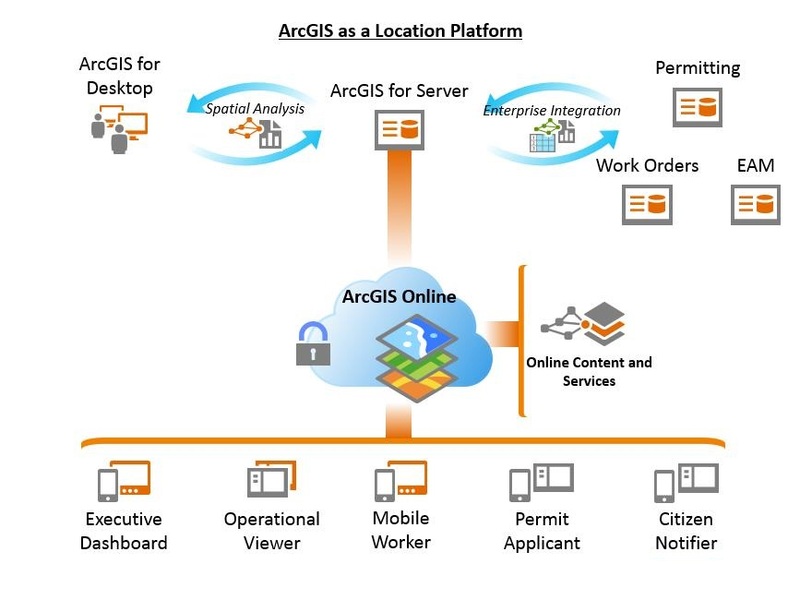 The mobile workforce (which can include anyone in the organization) will access it via Collector for ArcGIS which is included with ArcGIS Online. The permit applicant would access information telling them about the status of their permit using an ArcGIS Online web map and/or app or a Story Map. The citizen would be able to find out information about permits and work orders as well as capital projects via a web map and/or app or a Story Map. With a location platform, people within your organization get access to the information they need on the devices they use to do their jobs better. In terms of GIS, that’s how we measure success. Here is another example, using a Map Journal Story Map, of what it looks like for a Location Platform to be implemented to support the business of a water utility. By migrating your GIS to a Location Platform that supports business, it will raise the value and importance of GIS within the organization, making it even more of a mission-critical part of everyday business. Esri and our partners are here to support your transition to an ArcGIS Location Platform and empower your organization with spatial functionality across all of your systems and devices.